We’ve had the poison dart frogs here in the Boettcher Memorial Tropical Conservatory since early November when they were still pretty young. Conservatory staff members have been raising fruit flies, dusting them with vitamins, and feeding them to the frogs every day since then, and we are amazed at how much the frogs have grown. 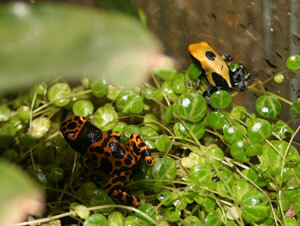 The calling is done by the male frogs, who are trying to impress potential mates with their beautiful trilling song. Our frogs are still less than a year old, so they have at least a year before they are of reproductive age, but we are impressed at this new sign of their healthy development. The frogs are an ongoing exhibit and are here to stay, but are also currently the subject of an animal behavior project for a Metro State student, who spends half an hour at a time watching the frogs and recording their behavior. Otherwise there is no one on staff who has the time to spend patiently waiting for a frog call! We’ll be excited to get further updates on activities in the tank, and we’re hoping to be able to record the frog calls soon.